So I’m really tired of storing my shoes in piles in the farthest corner of my closet. There is never enough floor space in a small closet, and before you know it, you are making multiple layers. Like that is really gonna work for more than 5 minutes. And while I am dreaming of the walk in closet in my future life, right now I have to find a way to make it work in a small space. (I hear every woman reading this groaning along with me in complete understanding.) These DIY shoe storage ideas for small spaces will help keep them organized and help extend their life as well. 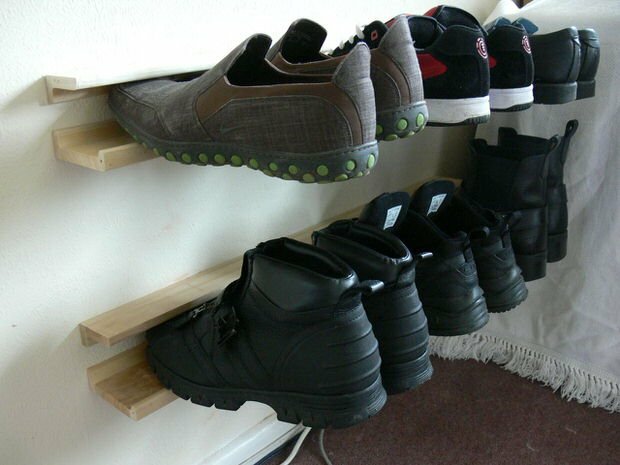 This IKEA hack shoe rack from ‘Instructables‘ is made from 2 Ikea shelves. Complete downloadable tutorial, and really clever DIY shoe storage idea! 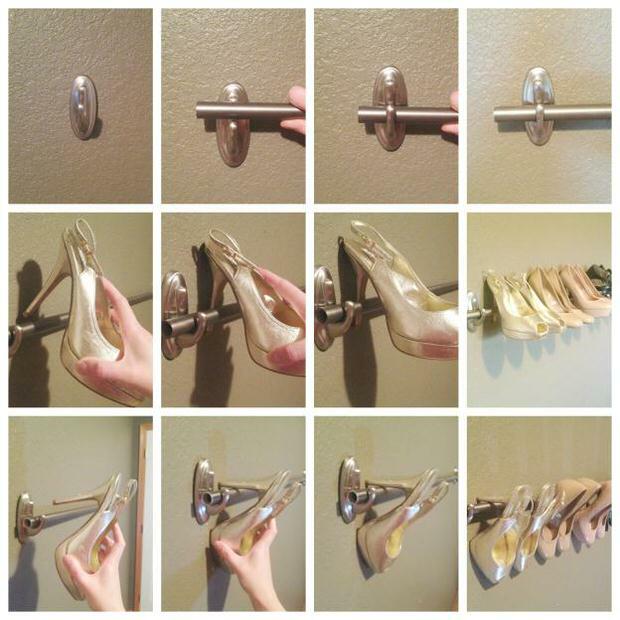 This crown molding shoe storage idea from ‘Picklee‘ has the same idea, but for shoes with heels. Ok, when I do get my walk in closet, I still want this show rack in there! 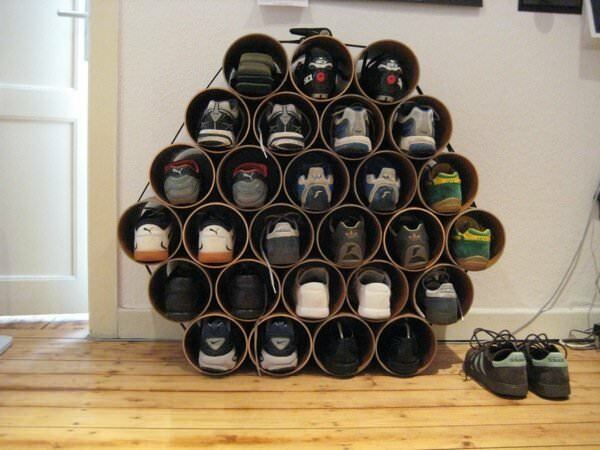 Like this shoe rack made from drain pipes? From ‘Apartment Therapy‘, this DIY shoe storage idea uses no tools if you have your pipe cut at the home improvement store. Nope, they aren’t glued together, go find out how this rack works! Our next project is from Brad at ‘Fix This, Build That‘. This adjustable shoe rack bench is perfect for a family, or for a home where you choose not to wear shoes indoors. That way, everyones’ shoes are accessible right at the door, and there is even a place to sit down to put them on! This DIY shoe storage idea comes with free plans as well. 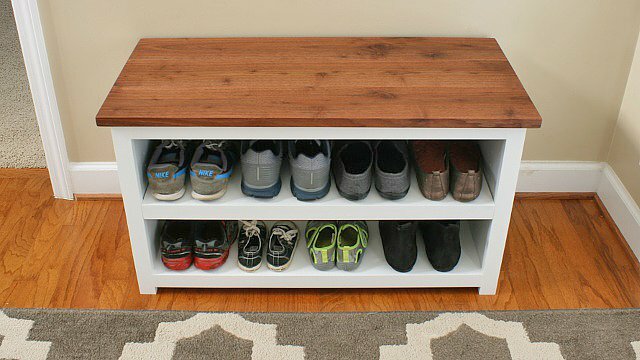 Janie from ‘The Eisenharts‘ has another IKEA hack for you with this easy & cheap shoe storage DIY project. You know those little rails that they have in the kitchen department? You know, the ones that you can hang those cool little buckets on for kitchen tools, etc.? Well, read her post! 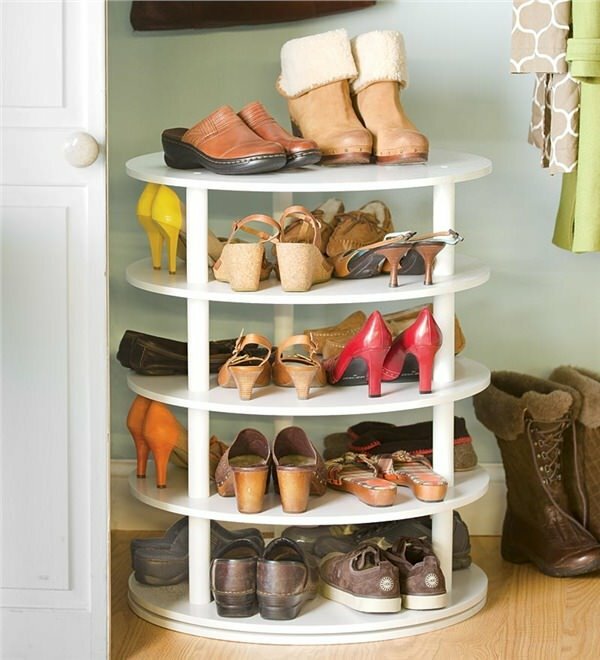 So, do you just love this ‘Plow and Hearth‘ rotating shoe rack? Well Amy from ‘Her Tool Belt’ via ‘Remodelaholic‘ gives a full tutorial and drawings to make this exact same rotating shoe rack, DIY! 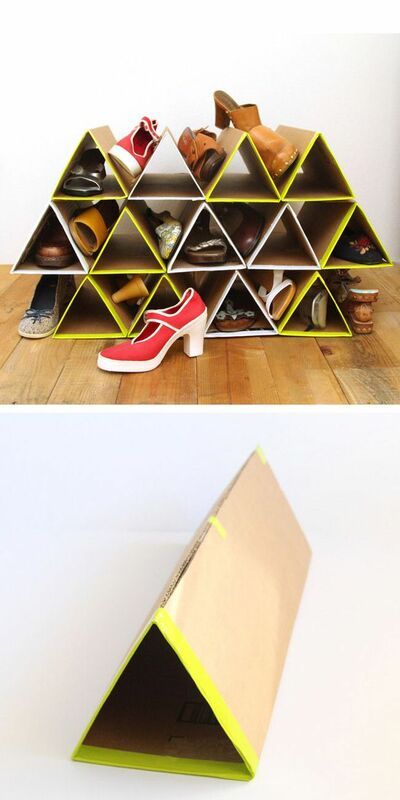 This space saving DIY shoe storage idea from ‘A Piece of Rainbow‘ is made from simple cardboard. Complete tutorial here with lots of step by step photos. I love the geometric look of this! 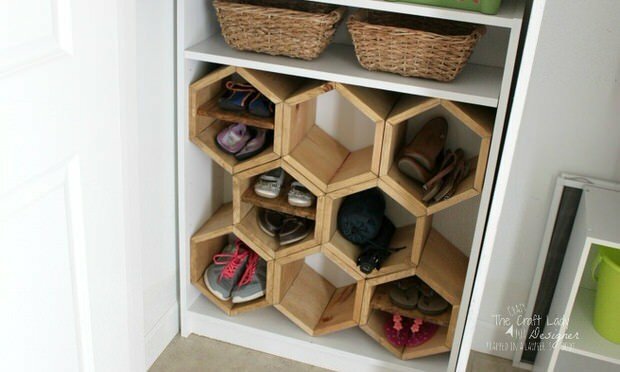 Aimee at ‘The Crazy Craft Lady‘ did this great tutorial for ‘Designer Trapped’ of this hexagon DIY shoe storage. This is a sturdy project that can be added onto over time. Love ‘Command’ hooks? You know, those ones you can remove later on with no marks to the wall? 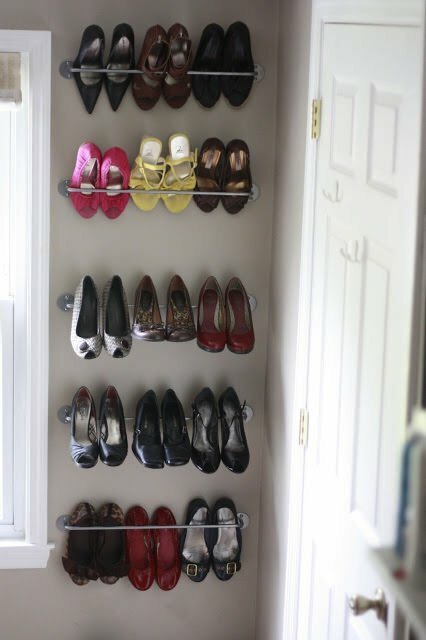 This shoe storage idea for heels was a great idea found on their blog by contributor Kayla. She used the hooks to hang curtain rods, then hooked on her shoes. Clever! Last one we have for you is this great idea from Ann Marie at ‘White House Black Shutters‘. She used these crates she just had to have (been there?) 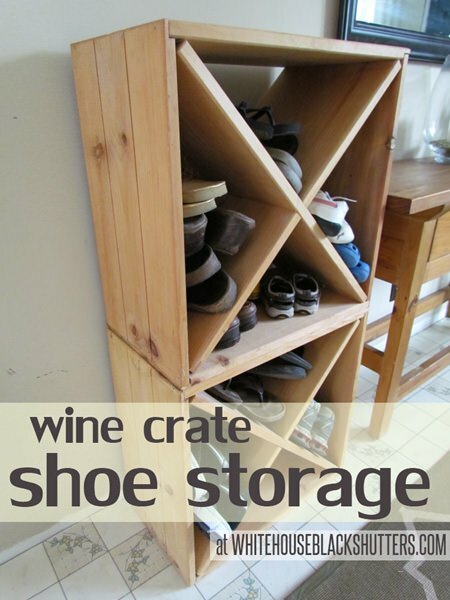 to make this wine crate shoe storage DIY. Love the idea, all you need is some small wood pieces for dividers! We hope you loved our post on DIY Shoe Storage Projects! We think you will also love DIY Closet Organizing Ideas and Clever Storage Ideas You Never Thought Of! wish you and your family a great 2016! !